As a public service, I am once again making public my history of the Pentagon Papers case. On the 40th anniversary of the publication of the first story about the “massive leak” of top-security government documents, it is a good time to brush up on the issues, the characters, and the law involved in this constitutional crisis. The case remains a landmark and remains as relevant as the latest headline about WikiLeaks. The following is an excerpt from my book, which is now due out in February. Until then, here is the latest draft. If you have corrections/suggestions, please leave them in the comments. Ellsberg, an expert in decision-making theory, was a civilian working at the Rand Corporation, a private think-tank that did a lot of analytical work for the U.S. government, especially the Defense Department. While he was working on the Pentagon Papers, Ellsberg underwent a profound personal conversion about he war–from enthusiastic hawk to passionate dove. Part of the reason for this change lay in the Papers themselves. In the mountains of documents (which he read in their entirety, even in areas where he was not tasked to contribute) Ellsberg came to believe that the problem was not the one he expected–that presidents lacked solid information about Vietnam. They had plenty of information. The problem was, those presidents had all chosen to lie about it. At the same time, Ellsberg was meeting leaders of the growing and increasingly vocal antiwar movement, who were posing questions that he found troubling: What right does the U.S. have to intervene in the lives of far-away peoples who pose us no threat? What is the moral justification for planning a war in which the deaths of Asian people are not even a factor? In his new-found determination to help stop the war, Ellsberg began to think that perhaps the Pentagon Papers themselves could make the difference. If the American public only knew what was in that study, they would see what he had seen – that Vietnam was a disaster, one that president after president had led us deeper and deeper into, always while claiming that victory or “peace with honor” was just around the corner. With the idea of divulging the study’s contents, he began secretly photocopying in October 1969. It was a daunting task. With help from a friend, Ellsberg developed a system. He put as many pages as he could carry in his briefcase at Rand’s office in Santa Monica, California. At the end of the day, he would wave to the security guard and leave with the briefcase, then head to another friend’s advertising agency, where he had permission to use the Xerox machine all night. That meant that Ellsberg had to lay each page face-down on the glass plate, push a button, wait, remove the original, replace it with another, push the button again, and so on. Each night he would wrap up, catch some sleep, and return that night’s batch of documents to Rand. “I took it for granted that what I was doing violated some law, perhaps several,” Ellsberg recalled years later. As a contributor to the study, Ellsberg had a top-security clearance, and he was authorized to have access to the set of the Pentagon Papers at Rand. Whether he had any right to make copies and distribute them remained to be seen. Aside from the legal issues, copying the Pentagon Papers was a physical challenge. The study was massive. Each set ran to forty-seven volumes, about 7,000 pages in all. Just fifteen official copies had been made, and most of those were stored in a vault at the Pentagon. The whole thing was classified “TOP SECRET-SENSITIVE” and bore warning stamps on the front and back covers and on every page. Under the protocols of the federal classification system, a document must be classified at the highest level of its most sensitive contents. Thus, if a volume of the Pentagon Papers consisted of a mix of analysis written by a historian buttressed by secret diplomatic cables or orders to units in the field, then the whole volume was treated the same as its most sensitive part. As Ellsberg well knew, the Pentagon Papers were packed with secrets–everything from the fruits of U.S. spy agencies to private exchanges between world leaders, from plots to carry out coups to estimates of other countries’ intentions. As Ellsberg considered his options in late 1969 and early 1970, his first thought was to try releasing the Papers through a member of Congress. He hit upon Sen. J. William Fulbright, the Arkansas Democrat who chaired the Foreign Relations Committee and who was the most prominent congressional critic of U.S. involvement in Vietnam. Ellsberg also approached Senators McGovern, Gravel, and Mathias, hoping that one of them could use his congressional immunity to introduce the Papers into the Congressional Record. In the end, after taking more than a year, they all found reasons to decline. So, Ellsberg went to his fall-back position and thought about giving a set of the Papers to the press. In his mind, there was one obvious choice, one newspaper with the resources, the sense of history, the track record: The New York Times. And at the Times, there was an obvious choice: Neil Sheehan. Sheehan, who had been the Saigon bureau chief for UPI in the early 1960s, knew as much about Vietnam as anyone. He had since joined the Times, where he was a Washington correspondent, still very much involved in covering the war. 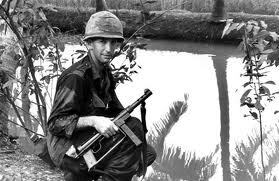 One thing that impressed Ellsberg about Sheehan was a piece Sheehan had recently written for the Times’ Book Review on the subject of war crimes and the application of war crimes doctrine to U.S. actions in Vietnam. Ellsberg was struck by the passion Sheehan showed in his writing, the urgent desire to end the fighting and bombing. Around this time, Ellsberg left California for Cambridge, to begin a fellowship at MIT, and he continued making more photocopies of the Pentagon Papers. Ellsberg assumed that the FBI was watching his apartment, on a side street just off Harvard Square, so he kept his set of the Papers nearby, in a box at the apartment of his brother-in-law. While Ellsberg organized the contents of the box, his wife, Patricia, took batches to several copy shops in Harvard Square. These shops had fairly powerful, commercial copiers, but it still took a long time; all the while, Ellsberg had to wonder what might happen if a clerk at a copy shop read some of the contents and decided to drop a dime into a pay phone and call the authorities to see if they’d like their secrets back. Ellsberg and Sheehan continued to discuss the ground rules for a handoff of the giant secret study. Oddly, perhaps, one issue they did not discuss was confidentiality. Ellsberg just assumed that Sheehan would protect his identity, but nothing was ever spelled out. Of greater concern to Ellsberg was the political goal of stopping the war. To that end, he wanted a commitment that the Times would definitely publish and that the newspaper would include in its reports some of the actual documents contained within the Pentagon Papers. As a mere reporter, Sheehan was in no position to make promises that would bind the newspaper, but he pledged to do his best. Ellsberg met him halfway, saying Sheehan could inspect the Papers and take notes on them, to give Sheehan the evidence he would need to try to persuade his superiors at the Times. On that basis, Ellsberg let Sheehan into the apartment and gave him a key so he could come and go as he went about the tedious business of reading and taking notes. Sheehan asked for photocopies, but Ellsberg was not ready yet to take that step. After a few days, Sheehan headed back to Washington to begin the process of pitching the idea to his editors. Not too long after that, it appears that, unbeknownst to Ellsberg, Sheehan returned to Cambridge, this time with his wife, the journalist Susan Sheehan. On a weekend when they knew that Ellsberg would be away, the Sheehans checked in under fake names to a hotel near Harvard Square. Using the key to the apartment that Neil had held onto, the Sheehans (according to Ellsberg) let themselves in and removed an entire set of the Papers. At some point, Sheehan used a pay phone to call the Boston bureau of the Times and asked the local correspondent, Bill Kovach, for some of the paper’s money. Kovach, in turn, called New York and got $1,500 wired to him. [iv] The Sheehans took the study to a nearby copy shop and got a complete duplicate made. Then, they returned the first set to the apartment and slipped out of town. After several weeks of examining the Papers in Washington, Sheehan was making headway in getting the newspaper’s top executives to commit. The most important figure on the news side was the managing editor, A.M. “Abe” Rosenthal, who was no dove when it came to the war in Vietnam. Rosenthal, however, determined that the project was potentially significant and took over close supervision himself. He had Sheehan’s photocopied set brought to the Times’ newsroom on West 43rd St. in Manhattan, but soon thought better of it. He did not want the FBI storming that hallowed journalistic ground to seize files. Instead, Rosenthal ordered the establishment of a separate command post in several suites at the midtown Hilton Hotel. Everyone involved (which ultimately ran to about seventy-five reporters, editors, clerks, and design personnel) was ordered to keep mum about “Project X.”[v] They had reason to be careful. The set held by the Times represented an unprecedented breach of the national classification system, and anyone in possession of it could face criminal charges, not only of stealing government property but perhaps espionage or, ultimately, treason. Indeed, that was the opinion reached by the Times’ long-time law firm, Lord Day & Lord. Senior partner Louis M. Loeb objected to the idea of publishing leaked military secrets in wartime, which he considered irresponsible and unpatriotic, and he warned that the government would be sure to prosecute the newspaper and its top executives. He urged the editors to return the Papers to the government. Sulzberger decided to listen instead to the company’s in-house counsel, Jim Goodale, who was more sanguine about staying out of jail. With that question still unresolved, Sulzberger decided to let the project move forward but to proceed carefully. By now, he had eight years under his belt as publisher, and he felt a lot more confident than he had in his first year, when JFK had tried to bully him into transferring Halberstam out of Saigon. Still, confronting the president of the United States would be a challenge. In one room at the hotel, Sulzberger assembled the newspaper’s lawyers to help him decide whether to publish anything at all. They argued over issues of sedition, corporate liability, and professional responsibility. In another room, he assembled a select group of the paper’s senior editors and top reporters to wade into the documents and help him determine what to publish. It was tough going in both rooms. In the roomful of journalists, the Papers were providing dozens of leads and tantalizing revelations. But the report as a whole was so vast that it would take a long time to find a story line in there. What was the upshot? What was the headline? Week after week, debates raged in both rooms. Was the Times about to break the law by giving away classified information during wartime? Would the government bring a charge of treason? If so, could the paper survive? Finally, the stories were ready. It all came down to Punch Sulzberger. It was time to say yes or no, time to put all his chips–the paper he loved, his family’s legacy, the good of his country–on the table. His answer was yes. So, on Saturday, June 12, 1971, while President Nixon was dancing in the White House at the wedding of his daughter and enjoying what he called the happiest day of his presidency, the typesetters and pressmen at the Times began printing the stories that would bring about a first-order constitutional crisis. The lead article, written by Neil Sheehan, said that a “massive” study commissioned by Defense Secretary Robert McNamara showed that four presidential administrations “progressively developed a sense of commitment to a non-Communist Vietnam, a readiness to fight the North to protect the South, and an ultimate frustration with this effort to a much greater extent than their public statements acknowledged at the time.” The story went on in that vein–not exactly a bombshell, more like the pebble that starts the landslide. The Times promised more stories and more documents in the following days. The stories caught the White House off guard. In all the months of deliberations at the Times, no one had contacted the White House for comment, so the initial story came out of the blue. At first, the president decided to do nothing. In telephone calls he had on Sunday with Gen. Alexander Haig and Secretary of State William Rogers, Nixon said he had not even read the Times story, and he seemed more interested in the political impact than in the security breach, although he did call it “treasonable action on the part of the bastards that put it out.”[vi] To Nixon’s mind, the important thing seemed to be that the series criticized Democrats–Kennedy and Johnson–and not him. Then, his national security adviser, Henry Kissinger, went to work on him. Kissinger, even though he was one of the most astute and prolific leakers in history, argued that the conduct of U.S. diplomacy depended on plugging the leaks. Then he played his trump card, warning Nixon that if he tolerated this massive security breach, “it shows you’re a weakling.”[vii] That did it. If there was one thing Nixon feared, it was vulnerability. So, he began to weigh other options. On Tuesday, June 15, 1971, government lawyers went into federal court in Manhattan and asked the court to enjoin the Times from publishing anything further about the Pentagon Papers. That was a momentous step. It was the first time since the adoption of the U.S. Constitution that the federal government had tried to impose “prior restraint” on a newspaper, based on grounds of national security. Not since the British crown ruled over the land had a publisher of a newspaper been told by the government in advance what it might or might not print. That was the essence of the constitutional crisis. Did the president have such power? If so, the Constitution did not grant it explicitly. From the newspaper’s point of view, the issue was the plain meaning of the First Amendment, with its sweeping ban on abridging the freedom of the press. From the president’s point of view, the issue was his duty as commander in chief to safeguard the nation by keeping its military, intelligence, and diplomatic secrets, particularly in time of war. Citing the Constitution, both sides prepared for a legal showdown. At the outset, the case did not look promising for the newspaper. The matter was assigned to Judge Murray Gurfein, a veteran of Army intelligence in World War II and a Republican who had just been appointed by Nixon himself. It was Gurfein’s very first case as a judge. After a brief hearing, Gurfein granted the government’s request for a temporary restraining order and set a hearing for Friday. 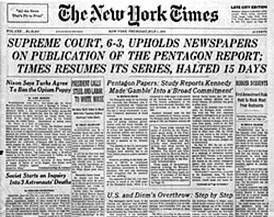 Significantly, the Times obeyed the court order and suspended the series about the Pentagon Papers. For the time being at least, the government had in fact imposed prior restraint. At the Washington Post, editor Ben Bradlee and his team had been hearing rumors of a big project at the Times but could not crack the secret. When the Pentagon Papers story hit on Sunday, Bradlee was beside himself. His immediate goal was to match what the Times had. He threw all his resources at it. Meanwhile, with the Times now enjoined from publishing anything further, Ellsberg became concerned that the momentum of the initial disclosures would evaporate and that the remaining documents might be successfully suppressed in court. Using a series of intermediaries and pay phones, he placed a call on Wednesday to an editor he knew at the Washington Post, Ben Bagdikian. [viii] If the Post could commit to publishing, Ellsberg said Bagdikian should fly to Boston to get a set–and bring a large suitcase. So, Bagdikian flew to Boston on Wednesday and got his own set of most of the documents. With a version of the Papers in hand, the Post now swung into action, setting up a command center at Bradlee’s house in the Georgetown section of Washington. In one room, the writers got to work. In another room, the editors and lawyers got busy trying to decide whether to publish. They had twelve hours to do what the Times had done in three months. In some ways, their challenge was more difficult than the one faced by the Times. For one thing, the lawyers pointed out, the Post (unlike the Times) was contemplating publication in an environment in which a federal court had already issued a restraining order. The order did not apply to the Post, but that was something of a technicality; the lawyers could hardly maintain that they did not know how the executive and judiciary felt about publication. Post executives also had another worry that had not concerned the Times: the Post company owned several television stations, and the Nixon administration could be expected to seek revenge by using its majority in the FCC to block the renewal of those lucrative broadcasting licenses. What’s more, the Post company, strapped for cash, had just decided to join the trend toward selling stock to the general public. If the publisher, Katharine Graham, were charged with a felony for publishing the Pentagon Papers, the brokerage house underwriting the sale of the stock could back out of the deal; if convicted of a felony, she could be stripped of her television licenses. Either one might mean the end of the Post as a business enterprise. Finally, after frantic debate, the editors reached Mrs. Graham, who was hosting a dinner party at her home. On a conference call, she was told that it was now or never. She quickly gave her answer: “Go ahead, go ahead, go ahead. Let’s go. Let’s publish.” Like Arthur Sulzberger, Katharine Graham was betting the house–the company, the newspaper, the family’s reputation. Like Sulzberger, she did so not only because she had good journalistic instincts but for another key reason. The fact was, she could. She owned enough of the paper to do whatever she wished. For better or worse, the publishers of the Times and the Post were answerable to no one. No less than Pulitzer, Hearst, or Luce, they were at the peak of their personal power. They were operating at a period in which their newspapers were profitable and the publishers were about as autonomous as they ever were. If they chose, they could stand up to the president himself. So, the copies of the Washington Post that appeared on Friday morning carried a front-page story about the massive Vietnam study, revealing that the Post had obtained the same classified materials as the Times. Government lawyers swiftly went into U.S. District Court in Washington seeking to impose prior restraint on the Post. Judge Gerhard Gesell refused to issue a restraining order, prompting the government to appeal. The appellate court reversed, and the Post was now in the same position as the Times – possessing the classified documents but muzzled from sharing them with the American public. Meanwhile, all eyes were on the U.S. District Court in Manhattan, with Judge Gurfein presiding over a session to argue the merits of continuing the injunction against the Times. The newspaper’s lead attorney was Alexander Bickel, a Yale Law professor. [x] He opened by noting that the Washington Post had published details from the secret report that very day and shared the story with the clients of the Post’s syndicated news service. The cat was out of the bag. There was no reason to continue enjoining the Times. Besides, Bickel continued, even after the disclosures by the two newspapers from the secret report, the sky had not fallen. “The Republic still stands,” he declared, drawing cheers from the crowd in the courtroom cheered. Gurfein banged his gavel for order and later cleared the courtroom entirely for a closed session to hear the substance of the government’s claim that the Pentagon Papers contained secrets that, if disclosed, would threaten national security. The hearing went on for hours, followed by more arguments in open court until well past 11 p.m. In one concession to the government, however, the judge extended the restraining order against the Times until the government had a chance to appeal. On Friday evening, ruling in the government’s case against the Post, Judge Gerhard Gesell in Washington, had reached a similar conclusion and refused to impose prior restraint on the Post. The government promptly appealed (and secured a temporary restraining order against the Post), which meant that the two cases went to different circuits of the U.S. Court of Appeals. While lawyers argued, Ellsberg’s strategy of diversifying the outlets for publication bore fruit, and parts of the Pentagon Papers began appearing in some twenty newspapers nationwide, including the Boston Globe, the St. Louis Post-Dispatch, and the Christian Science Monitor. Meanwhile, the Times and the government both appealed to the U.S. Supreme Court. The legal stakes were as high as they get. There was essentially no case law on this legal question, so the judges lacked almost all precedent. On Friday, June 25, the high court, acting with rare speed, agreed to review both cases and ordered oral arguments the very next morning. On Wednesday, June 30, just fifteen days after the government had initiated the case, the justices assembled again. The chief justice read the court’s ruling. Although the justices wrote nine separate opinions, it was a clear-cut victory for press freedom. By a 6-3 margin, a majority had decided that the Times and the Post could resume publication of their series. When word reached the two newsrooms, reporters broke into cheers (which they don’t do very often), champagne flowed, and stories that had been frozen by the Nixon administration were quickly readied for publication in the next day’s papers. Because of the stakes involved, the high court’s ruling deserves close attention. [xi] Among the nine justices, there were three distinct schools of thought. One group of three (Justices Hugo Black, William O. Douglas, William J. Brennan Jr.) took a view sometimes known as “First Amendment absolutism.” That is, they believed that when the Constitution says “make no law . . . abridging the freedom of the press,” it means just that–the government may not restrain the press, no matter what. According to Black, “every moment’s continuance of the injunctions against these newspapers amounts to a flagrant, indefensible, and continuing violation of the First Amendment.” In this view, press freedom exists to serve the American people, the ultimate sovereigns in a system of self-government. “The press [is] to serve the governed, not the governors,” Black wrote. If the press causes some harm, then the remedies have to come after publication and not before. With such a 3-3 split, the three remaining justices (Potter Stewart, Byron White, Thurgood Marshall) held the balance. In answer to the question of whether the government could ever impose prior restraint, they said, in effect, it depends. To begin with, the government faces a heavy burden of proof in such cases. More important, they went on to spell out the conditions under which prior restraint might be justified in the future: the government would have to show that publication would present an immediate, serious, and irreparable harm to the national security. The threat could not be far-off or hypothetical; it could not be a matter of politics, or mere inconvenience or embarrassment. In the case at hand, they ruled, the government had not met the standard they had just invented. On that basis, they joined with the absolutists and held that publication could resume. First and foremost, of course, the 6-3 ruling was a tremendous legal win for the news media, on the scale of an earthquake that reshapes the landscape for a long time to come. The verdict remains the law of the land more than three decades later and may stand for a good deal longer. In the first showdown over prior restraint, the press won and the government lost, an outcome that pretty thoroughly repudiated the whole idea of prior restraint and created a de facto moratorium on its use. That much is clear. What is more difficult to measure is the psychological impact. But judging by the record, it seems fair to say that the press as an institution was emboldened by the Pentagon Papers case. The experience of taking on the president (which, in this case, also meant Defense, Justice, and State) and coming out on top was a heady one. It would be only natural for a publisher, editor, or reporter to think that maybe the press really was some kind of Fourth Estate, that the media could tackle other powerful institutions, that journalism could do more than record the things that other people say and do. The Pentagon Papers also vindicated the early reporting out of Vietnam, by Halberstam and others, which had tried to point out that the war effort was not working. Particularly when the Papers were printed in book form (as they quickly were), the government’s own documents could be used to settle some of the debates over the war. All the reporting that had caused so much controversy and bitterness for the Saigon press corps in the 1962-65 period was fully documented. In fact, if anything, the Papers indicated that the situation had been even worse (and more duplicitous) than even the most critical reporting had indicated. If they were going to report on the government, reporters concluded, they were going to have to become a lot more cynical. The Pentagon Papers case also had an impact on American culture and politics. In terms of the “credibility gap,” the Pentagon Papers blew it wide open. The gap now became a chasm that threatened to swallow up every powerful institution in the country. No one could read the documents, or even the stories about them, without taking away the deeper message: the officials who run the White House and the Pentagon do not level with the American people. They exaggerate, they prevaricate, they even lie – all in pursuit of their own agendas. In terms of domestic politics, the Pentagon Papers provided fresh fuel for the antiwar movement. The release of the Papers also provided evidence that the government routinely abused the power to classify information, hiding materials from the public based on convenience or politics rather than national survival, and it showed that officials rarely caught up with the need to de-classify information. In a narrower political sense, the Pentagon Papers had the effect of ratcheting up the war between Nixon and the press. Nixon had always resented and loathed the press, and the outcome in this case left him apoplectic. One result was a desperate attempt to control information by plugging “leaks.” Nixon had found that the FBI did not share his sense of urgency about the problem, so he started to demand new ways of stopping leaks. In doing so, he was heading down a road to perdition, one that would ultimately doom his presidency at a place called Watergate. In terms of defining the relationship between government and the press, the court ruling left many questions unanswered. It did not define what legal protections, if any, might be enjoyed by government employees who divulge secret or classified information. Were these “leakers” to be treated like villains or heroes? Were they reformist “whistle-blowers” … or disloyal sneak-thiefs? The case also did not address the status of the journalists who collaborate with leakers. Do the journalists have any legal claim of confidentiality? Do they enjoy any of the privileges that protect clergymen or doctors from having to testify about the things people tell them in confidence? On these matters, the court was silent, leaving them to future courts and Congress to argue over. In fact, Ellsberg made available only forty-three of the forty-seven volumes, withholding four volumes of diplomatic history that contained many still-important secrets. According to the tape recordings of Nixon’s phone call to Mitchell on June 15, the attorney general and the president were feeling confident. In the end, the stock offering went ahead, along lines similar to those used by the Times in 1969. The Post offered about 1 million Class A shares, which were all owned by members of the Graham family, and about 10 million Class B shares, which could be bought by the public. Two years later, a big chunk of the Class B shares were bought by investor Warren Buffett, who became an important friend and adviser to Kay Graham. The date of the initial public offering was June 15, 1971, the day before Bagdikian got his copy of the Pentagon Papers. The most notable exception since 1971 came in 1979, when the government attempted to stop a magazine called The Progressive from printing what the magazine called “the H-Bomb Secret.” Citing the standard for prior restraint articulated in the Pentagon Papers case, the federal judge in the Progressive case ruled that the government had met its burden of showing “grave, direct, immediate and irreparable harm to the United States” and granted a TRO. While the case was pending, however, others published details about H-bomb construction, forcing the government to drop its case against the Progressive on the grounds that it was now moot because the secrets were tumbling out in a variety of public forums. Nixon always seemed to make a major distinction between authorized leaks and unauthorized leaks. The former was a tool of governance; the latter was a personal affront and an abomination. [x] When the Times’ long-time laws firm balked, Goodale recruited Bickel and a young First Amendment expert, Floyd Abrams, to help with the case. [xi] New York Times v. United States. 403 U.S. 713 (1971). Since the announcement of her appointment as the next top editor of The New York Times, Jill Abramson has received a lot of attention. At the same time, the newly designated leader of the most important institution in U.S. journalism has been fairly circumspect. It’s fair to say that more has been said about her than by her. But she did speak at length recently in a public forum: the annual conference on narrative non-fiction, hosted at Boston University. Abramson was one of the keynote speakers, sharing the honors with Gay Talese, Susan Orlean, Ken Auletta and other distinguished practitioners, and she went into some detail about her views on long-form storytelling as well as multimedia storytelling. All in all, her presentation gave some powerful signals about where she might lead the Times. Abramson was introduced by the main conference organizer, Isabel Wilkerson, who won a Pulitzer Prize while working as a reporter for the Times, then left to pursue her epic narrative of black migration within the United States, the much-acclaimed (and definitely long-form) book The Warmth of Other Suns. Abramson sees a “very robust future” for narrative non-fiction. She said her intention was to explore the roots of narrative non-fiction and to trace its relationship to today’s “dizzying” 24/7 news cycle. And she cited Talese’s Sinatra piece as another canonical work, one that she uses as the first reading every semester; she likes it because, among other reasons, it points up the need for obsessive reporting, which she said is even more important than access. Calling narrative non-fiction “a distinct American art form,” she said that the doomsayers were wrong when they predicted that the coming of the Web would destroy the love of reading. As evidence, she pointed to the “most read” and “most emailed” features in the Times, which often include lengthy pieces from the magazine. One recent example was the profile of Obama’s mother by Janny Scott (although Abramson acknowledged that the piece may have received a boost from the insanely cute photo of Obama in a pirate costume). Abramson said that after holding out for a while, she recently got an iPad and quickly became “slavishly addicted” to it. “It could make me a hermit.” In her view, the iPad (and presumably, other tablets as well) give narrative non-fiction new life by expanding its reach to a new audience — and it’s an audience that is getting used to the idea of paying for content. She described her 2010 sabbatical from her daily m.e. duties as a “deep digital dive” during which she spent considerable time looking at sites like Politco and HuffPO. Their readers, she decided, are mainly “snackers,” looking for what she calls “scoop-lets” – short , gossipy items. Abramson acknowledged that HuffPo founder Arrianna Huffington says she wants to feature longer articles. Problem is, according to Abramson, those pieces are time-consuming and therefore expensive. “You really can’t do original reporting by scraping the Internet.” You also need a cadre of reporters with experience. It is “a source of worry” that news outlets are continuing to cut back on their investigative teams and foreign bureaus — two notorious cost centers inside news organizations. So, where is narrative non-fiction still flourishing? It’s still around some of the old familiar places — the New Yorker and the Atlantic, to name two. But Abramson said readers can also find great reporting in new venues. She touted several other Websites, including The Atavist, Byliner and Longreads, as well as Kindle’s “Singles” program, which sells pieces in the 10,000- to 30,000-word range. 1) Alan Schwarz’s series on concussion in football and other sports. Abramson said Schwarz was a stringer when he started this series and then brought on staff specifically so he could pursue the topic. He was also “plucked” out of the Sports department and assigned to work with a special editor. “He was a math major who never studied journalism. He relies on the mathematical idea of the “golden ratio” — which he uses as his organizing principle when outlining longer pieces. Abramson then showed the conference audience the moving segment about Sgt. First Class Brian Eisch and his two adorable sons. P.S. 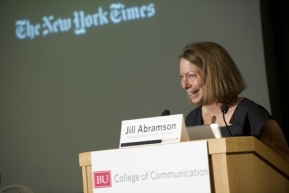 Boston University has helpfully posted a video of Jill Abramson’s talk, so you can see the whole thing for yourself. I love maps, so here are two. This one is a map of the blogosphere, based on ratings of popularity for various U.s. sites. It was created by Media Cloud, part of the Berkman Center at Harvard. The second is a map of the world, showing the location of all the newspapers. It takes a while to absorb it, and I can’t make heads or tails out of the button marked “historical,” although it seems important. Hat tip on this one to my son Gabe.